76-year-old man with squamous cell cancer of the oropharynx presents with lethargy and confusion. A decrease in QT interval is seen with hypercalcemia, which fits with the patient’s presentation and known malignancy. This gentleman’s ionized calcium was 2.2. The ST-segment is short or absent in hypercalcemia and the duration of the QTc interval is decreased. Although it is difficult to give an absolute QTc interval below which hypercalcemia is assured, this value is always <400ms and visually fairly obvious. Another occasional EKG presentation of hypercalcemia is leftward movement of the apex of the T-wave as in the above example, another example of hypercalcemia associated with malignancy. Diercks D, et al. Electrocardiographic manifestations: electrolyte abnormalities. J Emerg Med 27:153-160, 2004. 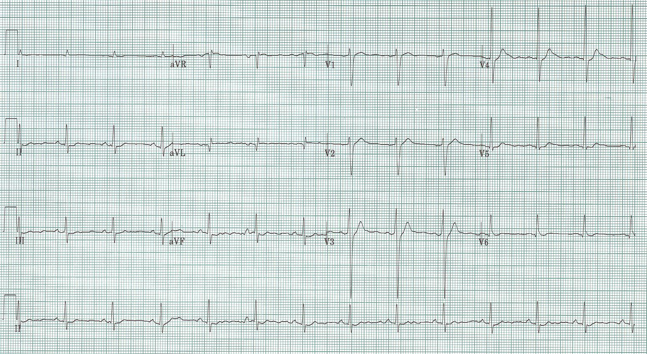 36-year-old man complains of palpitations and lightheadedness. The strip reveals a very rapid (at times approaching a heart rate of 300/minute) and irregularly irregular rhythm with a wide-complex QRS. You must assume that this represents atrial fibrillation conducting through a bypass tract. This is a potentially dangerous situation because rates that approach 300/minute can quickly degenerate to ventricular fibrillation. Additionally, treatment of this rhythm can worsen the ventricular rate by increasing conduction down the bypass tract. Avoid ABCD – adenosine, ß-blockers, calcium-channel blockers, and digoxin. Appropriate treatment includes procainamide and electrical cardioversion. Treatment with amiodarone is effective but controversial as amiodarone has a complex mechanism including actions which block the AV node and have been reported to cause deterioration of bypass atrial fibrillation. It was once recommended by ACLS, but was removed in the 2010 guidelines. After cardioversion to sinus rhythm the patient’s rhythm strip clearly reveals signs of WPW (short PR interval, prolonged QRS, and a delta wave). This patient went on to have bypass tract ablation so he wouldn’t have to experience something like this episode again. 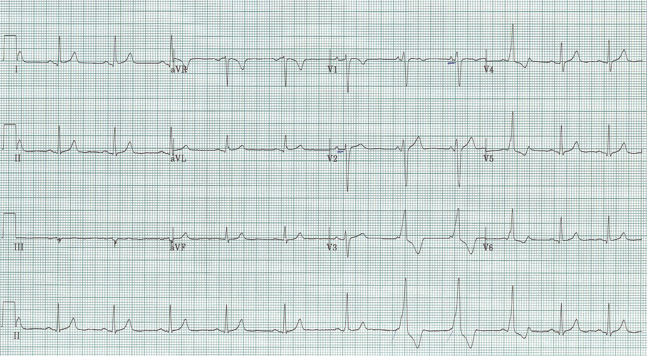 Note that the signs of WPW are now absent from the EKG. What is the rhythm change seen on this tracing? First, if you march the P waves through, they remain constant (note the pen marks of some helpful person). The 4th and 5th beats in this rhythm strip are wide-complex and dissociated from the P waves. 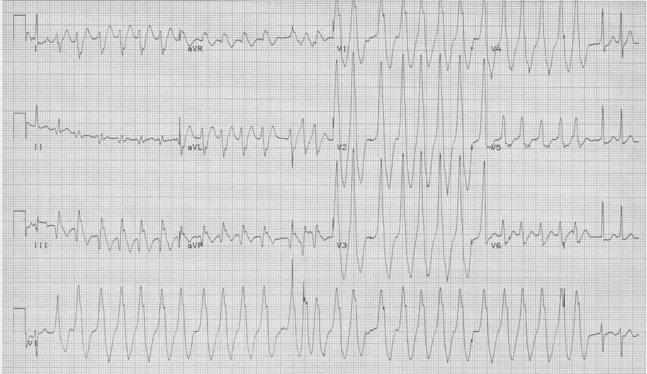 This rhythm is sometimes called “slow v tach” to indicate the independent (ectopic) ventricular source. This is accelerated idioventricular rhythm (AIVR). Another helpful feature of this ventricular rhythm are fusion beats as the rhythm phases in and out with sinus rhythm, often at a similar heart rate. In this rhythm strip, the 3rd and 6th beats are fusion beats – that is, a combination of the sinus beat and the ventricular beat. AIVR is well known as a repolarization arrhythmia (especially after TPA or interventional cath). It can also occur in essentially normal patients for no apparent good reason, as was the case in this otherwise healthy young woman.